A week before his 18th birthday, Deex Colebrook became the fifth recipient of the Charles Johnson Memorial Scholarship. It turned out to be an early birthday present, thanks to the Kiwanis Club of Cable Beach. The Bahamas Technical and Vocational Institute (BTVI) Auto Mechanics student has never met the late, Mr. Johnson – a Kiwanian after whom the scholarship is named – but he is certainly benefitting from his vision. Mr. Johnson, who passed away on May 10th, 2010, hosted Super Bowl fundraisers at his house each February, with the vision of granting a BTVI Auto Mechanics student a scholarship. It was a personal and passionate mission of his, particularly as a mechanic himself. And although he never saw the scholarship come to fruition, the Kiwanis Club of Cable Beach ensured it became a reality. The fundraiser continues each February. Tickets are sold in order to watch the game and eat to one’s heart’s content – all in an effort to grant a BTVI Mechanics student a scholarship. For the past four years, the scholarships have ranged between $1,500 and $2,000. Deex, who is a 2015 graduate of St. John’s College, was humbled and grateful to have been chosen. “I thank Kiwanis for this cheque. It’s a burden off my parents. It feels good that they don’t have to pay,” said the teenager. Deex began learning Auto Mechanics when he was in 10th grade, stating that he loves the sound of an engine and is ready to learn more about the intricacies of vehicles. The criteria for the scholarship includes acceptance into the Auto Mechanics program and maintaining a 2.5 Grade Point Average (GPA) or above. Last year saw the scholarship awarded to the first female recipient, Zananthonia Saunders. On hand during the presentation to Deex were BTVI’s Acting President, Dr. Iva Dahl and President of the Kiwanis Club of Cable Beach, Tareco Laing, both of whom encouraged the young man to remain focused. 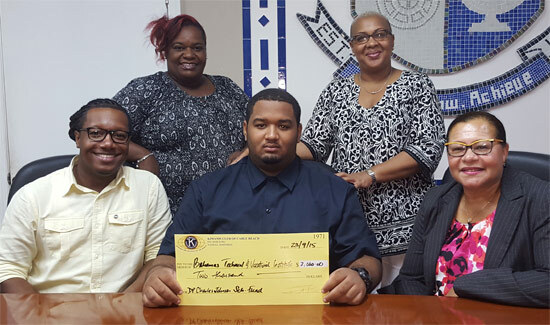 KIWANIS CLUB OF CABLE BEACH recently awarded the fifth recipient of the Charles Johnson Memorial Scholarship to BTVI Auto Mechanics student, Deex Colebrook. Shown seated from left to right are: Kiwanis Club of Cable Beach President, Tareco Laing; recipient, Deex and BTVI’s Acting President, Dr. Iva Dahl. Standing are Kiwanis Club of Cable Beach Assistant Treasurer, Michelle Cartwright (l) and Leesa Coakley, mother of the recipient.